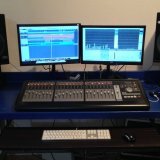 Ideally, I'd like to mount my new StudioLive 16 series III board on top of a mobile rack for use in my studio, as well as for mobile recording. It's a little over 21" deep, and I'm concerned that every time I pack it up, I'll have to remove every single cable from the back panel. I'd certainly prefer to leave it hooked up with the gear below it semi-permanently. Anyone got a good setup going on a mobile rack? Can anyone suggest a good make and model? I use the Odyssey DELUXE PRO COMBO RACK FLIGHT CASE WITH WHEELS AND ONE SIDE TABLE 11U Top Slanted Rack & 16U Bottom Vertical Rack. Because the SLSL 16 III is taller then the 16.4.2 I had to move the angle bracket on each side down 1"' but it works great. This might be more then you want but it was just what i was looking for.